Jupiter was an intermediate-range ballistic missile (IRBM) designed by the United States Army Ballistic Missile Agency (ABMA) as a successor to the Redstone. Its development led to America's first successful space launch vehicle. In late 1955, ABMA was directed to work with the Navy to develop both a land-based and sea-based version of the Jupiter. One year later, however, in the "Wilson Memorandum," the Army was stripped of all missiles with a range of over 320 kilometers. Subsequently, the Navy abandoned Jupiter in favor of the solid-fueled, submarine-based Polaris and the Jupiter was transferred to the Air Force. Although it eventually became the first operational American IRBM, the Jupiter was never given much attention by the Air Force as it competed directly with the Air Force-developed Thor. The Army-developed Jupiter had been a source of bitter rivalry between the two branches of service since its conception. Built by Chrysler, the Jupiter first stage was powered by a Rocketdyne engine that burned liquid oxygen (LOX) and RP-1 (kerosene mixture) to produce a liftoff thrust of 670,000 newtons (N). An ablative technology reentry vehicle made by Goodyear, which shrouded a one-megaton warhead, separated from the Jupiter following the detonation of explosive bolts. A Thiokol solid-fueled motor supplied final velocity trimming. Operational Jupiter missiles were delivered to the Air Force beginning in November 1957. Jupiter components were test-flown aboard rockets known as Jupiter A and Jupiter C, which were not really Jupiters at all but rather modified Redstones. An actual Jupiter was first test-flown in April 1957, and the missile was deployed by NATO in Europe before being withdrawn from service in 1964. Although short-lived, the Jupiter program played a key role in the history of the American space program. It led directly to the launch of America's first satellite aboard a Juno I, a rocket adapted from the Jupiter C, and the Jupiter missile acted as the first stage for the Juno II which carried a number of scientific payloads into space. Inert Jupiter missile shells ballasted with water were used as dummy upper stages for the earliest version of the Apollo-Saturn I. The first exploitation of the Redstone for testing components that would be incorporated into the Jupiter IRBM. Although the Jupiter A was identical to the Redstone, its name was intended to associate it with the Jupiter missile development program. However, Jupiter A flights really served a dual role: as tests of Jupiter missile hardware, and of Redstone missile performance at a time when the Redstone was still under development. Jupiter C was a multistage adaptation of the Redstone and follow-on from the Jupiter A, designed to test Jupiter missile nosecone technology. In 1955, a rocket nearly identical to the C was described in Project Orbiter. When Orbiter was rejected in favor of Project Vanguard, the multistage Redstone faced extinction. 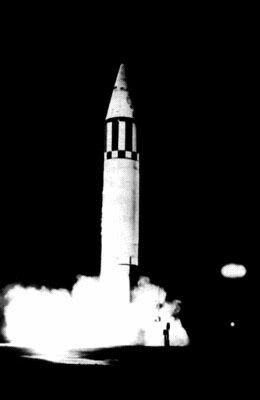 However, on September 13, 1955, four days after the official rejection of Orbiter, the Army and Navy were instructed to cooperate in the development of the Jupiter IRBM. Engineers at the Ordnance Guided Missile Center at the Redstone Arsenal were authorized to develop the Jupiter C for high-altitude reentry tests of Jupiter missile components. Although, like the Jupiter A, the C was really a Redstone the name was changed to Jupiter C – short for "Jupiter Composite Reentry Test Vehicle." It was similar to the Juno I but with important differences. The C was designed specifically to carry a nosecone into space and allow it to reenter at high speed. Both Juno I and Jupiter C used a Redstone first stage with stretched tanks to hold more fuel. But the Jupiter C Redstone booster burned LOX and alcohol, like the production version of the Redstone missile. The satellite-bearing Juno I first stage was modified to burn higher-energy Hydyne fuel. Both the C and Juno I used 11 clustered Baby Sergeant solid motors on their second stage, and three clustered Baby Sergeants on their third. However, since the C was never intended to launch satellites, it had no fourth stage motor. The Jupiter C first stage, with a liftoff thrust of 348,000 N, burned for 150 seconds after launch, boosting the upper stages to near-space. After first stage cutoff and separation, the clustered upper stages continued a ballistic ascent. The second stage was then fired for 6 seconds, moving quickly away from the rotating tub assembly. After second stage cutoff and a 2-second pause to allow stage separation, the third stage was fired for 6 seconds. It then separated from the payload, which continued a ballistic path toward ocean impact. Intense heat was created during reentry, allowing valuable scientific data to be gathered on flight dynamics and nosecone performance. This helped in the selection and development of actual nosecones to be carried aboard operational Jupiter IRBMs. 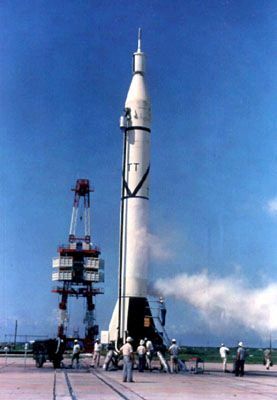 The first Jupiter C was launched from Cape Canaveral on September 20, 1956, and surpassed expectations. This C was the only one to carry an inert fourth stage motor ballasted with sand in case ABMA "accidentally" launched a satellite before Project Vanguard. The inert fourth stage reached an altitude of 1,097 kilometers and range of 5,390 kilometers, establishing Cape Canaveral records for both – a bitter-sweet success for ABMA. The Jupiter C had shown it was perfectly capable of launching a small satellite, yet bureaucracy forbade it to make the attempt. Although 12 Jupiter Cs had been authorized for construction, the research program was cancelled after just three launches in August 1957 by ABMA's chief, Major General John Medaris. However, Medaris ordered that all remaining C booster hardware be placed in protective storage, his intent being to keep the rocket components ready if the go-ahead was given to attempt a satellite launch. With Jupiter C performance data in hand, the Army continued to press for permission to try launching instrumented satellites to augment International Geophysical Year scientific research, but without success. Then came the shocking news that the Soviets had placed Sputnik 1 in orbit. By chance, ABMA officials were entertaining Secretary of Defense Neil McElroy at the Redstone Arsenal on that very day in October 1957. An effort was made on the spot to convince McElroy that ABMA deserved a chance to launch an American reply. Secret directives by Medaris followed, and Wernher von Braun, ABMA's technical director, was told to begin preparing Jupiter C hardware for action. Discussions were also opened with the Army-sponsored JPL (Jet Propulsion Laboratory) to evaluate specific satellite designs. McElroy did convince President Eisenhower that the Army's request merited consideration, but it would be almost two months after Sputnik 1's triumph before ABMA was given approval to schedule satellite launch dates. It was to be a major turning point in American space history. The Navy's Project Vanguard failed in its first attempt to launch a small tracking satellite on December 6, 1957, when the Vanguard rocket exploded on its pad. Then the Navy's second attempt, scheduled for January 24, 1958, was delayed until early February. Suddenly, ABMA's first shot at orbit, originally slated for five days after the Navy's second attempt, was next in line. But there would be one final twist before America entered space. In November 1957 William Pickering, head of JPL, suggested to Medaris that the satellite-bearing version of the Jupiter C be renamed. The recommendation was accepted by ABMA, and the Juno family of rockets was born.